Sinusitis is an infection in the sinus cavities on either side of your nose and above the nose and eyes. When these cavities get blocked by mucus, the resulting pain and pressure becomes a sinus headache. In order to cure a sinus headache, you not only have to treat the pain, but the underlying cause as well. 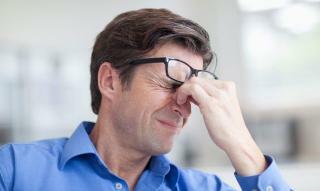 If your sinus headache is caused by an infection, you will typically experience other symptoms as well. Symptoms of a sinus headache caused by sinusitis include pressure around the nose and eyes, as well as a throbbing pain that gets worse when you bend over. You may also have a stuffy or runny nose and possibly a cough. Use over-the-counter pain medications such as acetaminophen, ibuprofen, or naproxen to relieve the pain. Try a decongestant to reduce the swelling in the nasal passages and relieve the pressure in the sinus cavities. If you are prone to allergies, try an over-the-counter antihistamine to help with a runny nose. Keeping your nasal passages moist is also very helpful. You can flush out them with warm water using a bulb syringe or a neti pot. Over-the-counter nasal sprays can also be used to relieve congestion, but should not be used for more than 2-3 consecutive days. Unfortunately, when nasal sprays are used for long periods of time, the congestion often gets worse when you stop using them. Sinusitis is commonly caused by viral infections, and most cases will go away on their own. However, sinusitis can be caused by bacterial infections and require antibiotic treatment. The best way to determine whether or not you need antibiotics is to be seen by a medical professional. If you are experiencing a painful sinus headache, visit your local FastMed Urgent Care to get the relief you need. Our walk-in clinics are open 365 days a year, and our medical professionals are dedicated to providing each patient with prompt and personal medical care. We’ll work to determine the cause of your sinus headache and provide you with the best treatment options.